This site features clean modern code and a clean modern design, which is responsive to browser changes and adaptible to mobile devices. The simple, crisp presentation does not show off the polish that went into the details of this nice site! 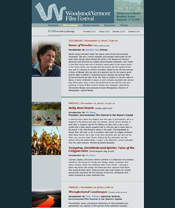 This site was only hot relatively briefly, because it was a promotion for an event. Working in collaboration with designer Brian Prendergast, we created a visually rich set of information (and with a lot of different CSS styling for different pages). 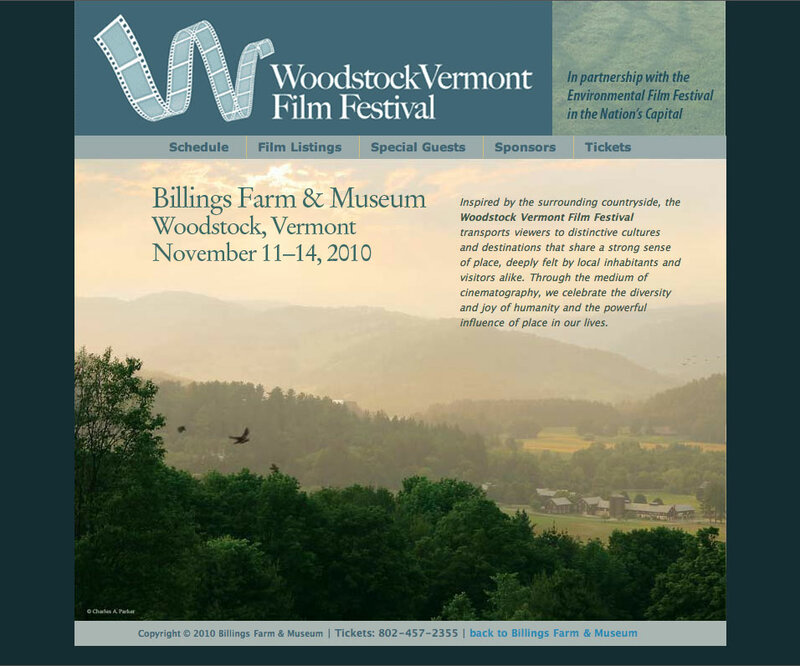 It was to promote a film festival at Billings Farm and Museum. 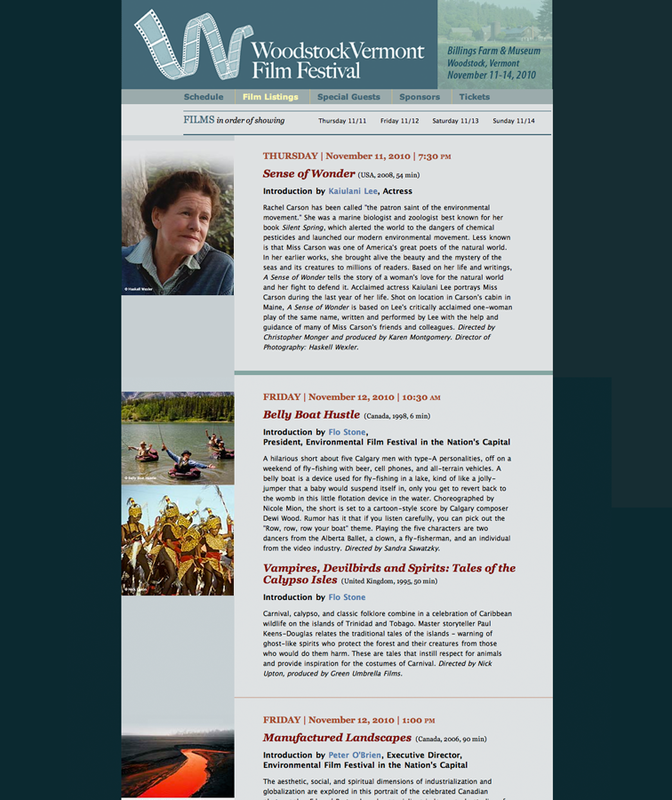 As of this writing the film festival pages are still up, here. I've included a presentation of static pages, below, since I don't expect the live pages to be up very much longer, at this point. 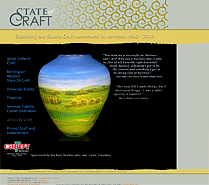 A special project in association with the Vermont Crafts Council, the State of Craft project details the recent history of craft in Vermont over the last decades. 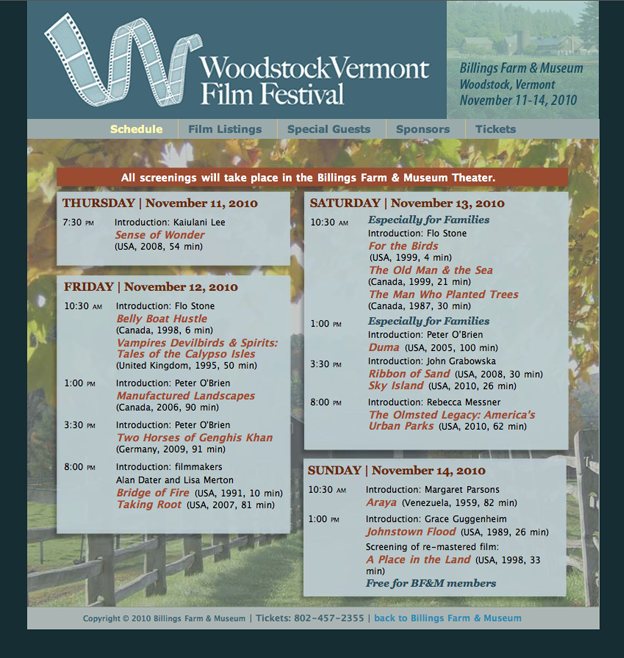 With an interesting timeline and series of events and interviews, it's a one of a kind and fascinating site for those interested in Vermont and people who make their living by making things. I like this design, which I based on print material related to the project. It's a sophisticated accessible CSS layout, and it's also based on a custom database integration I made. All of the individual pages about people are from a Filemaker database, and based on flags my program decides whether to make an interview or an event page. It's good! 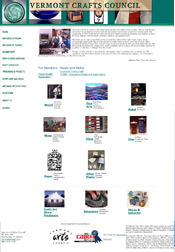 Working with a group of excellent photographs by Michael Yacavonne, I cropped selections for the rotating photo elements that refresh throughout this extensive site. This site is not my design. I maintained the navigation as it has went through various changes over several months. 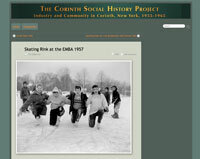 I have also designed a subsection of the site for a global conference held in the winter of 08. I also designed the program for that event, a printed piece. 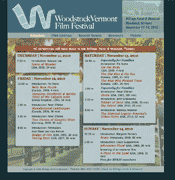 This is the design we used for several years, before a new logo and other needs spurred a redesign. Now the site has been taken in-house, after the principle moved to New York City and acquired in-house web talent. 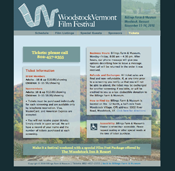 This is a non-profit site, an organization working for affordable housing in the Upper Valley. 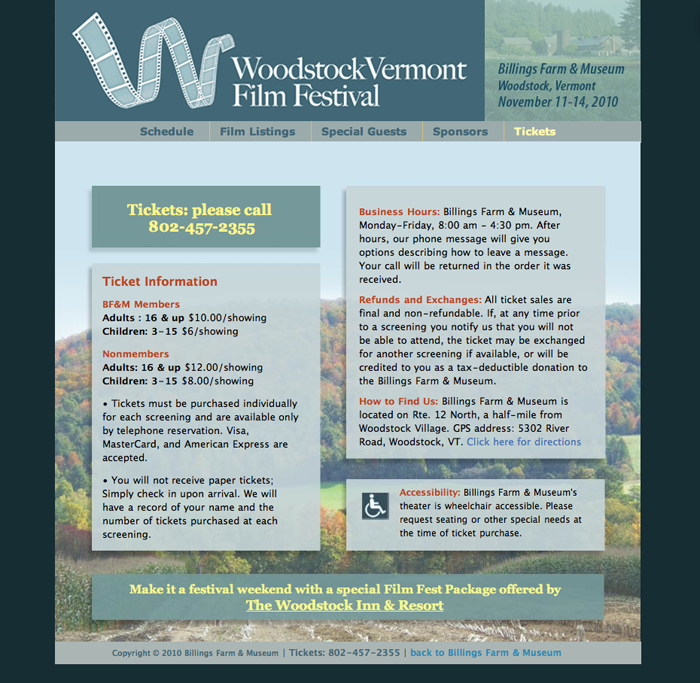 Jane Friedlander is a tutor in Thetford Vermont. We were both very happy with the result of our work together on her site. 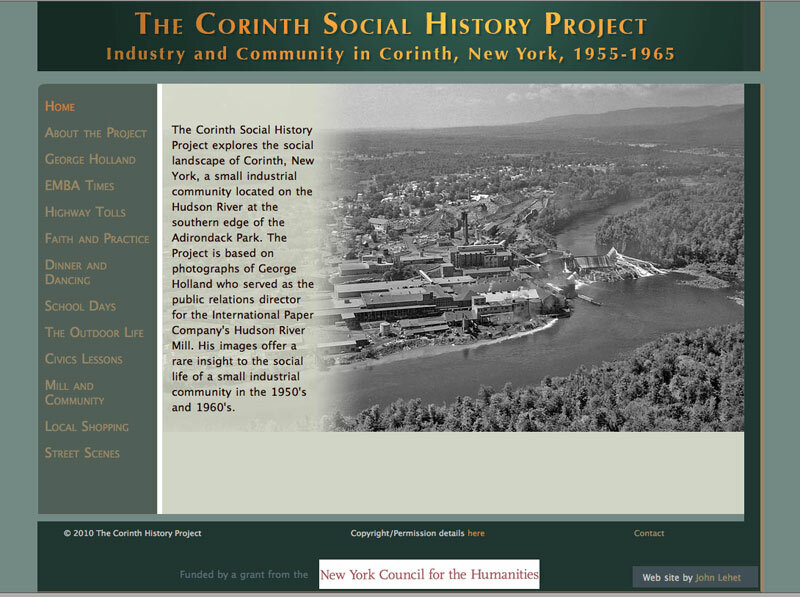 This is my most recent site for John Tariot. 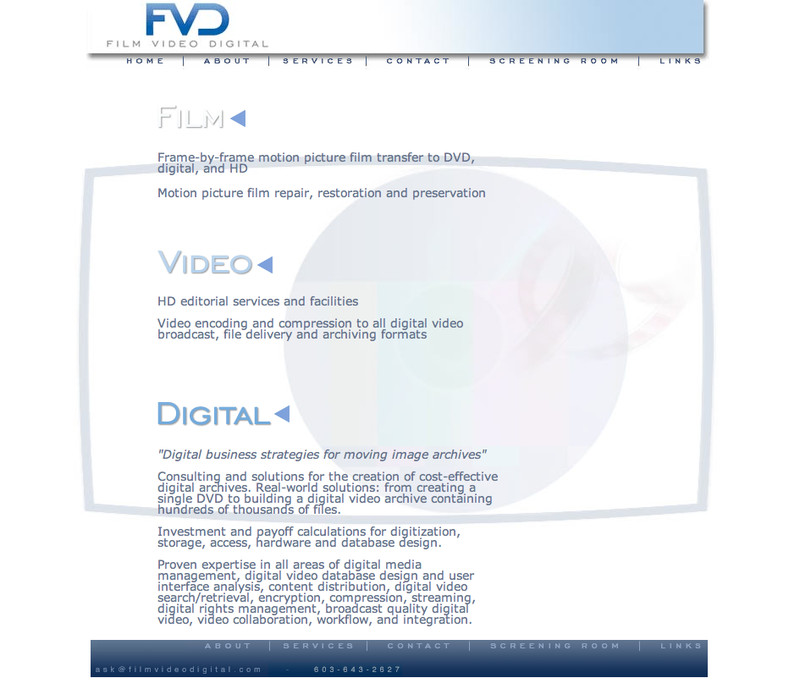 In the 90s I designed www.footage.net for him; he sold that site, and they kept my design for almost a decade. They've finally replaced it with a sort of non-design. 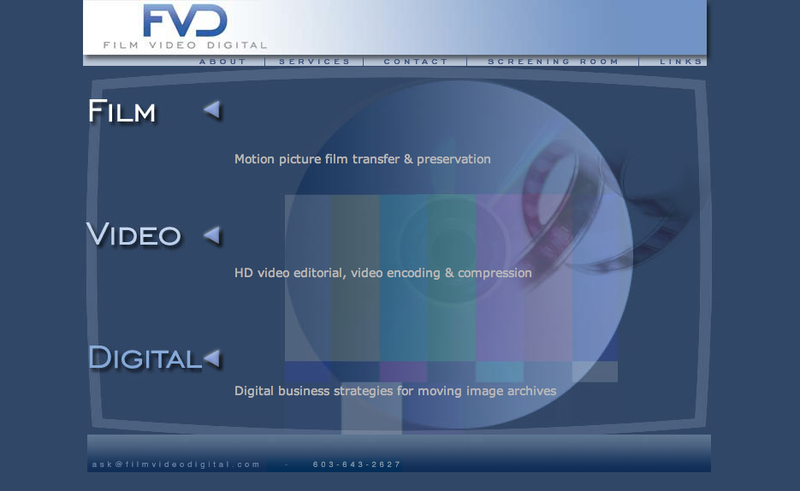 Film Video Digital supercedes my last site for John, which was called Moving Image Group. I liked that design too. It's always great to work for John Tariot, with his good eye and desire to get a good looking final result. This site is no longer live, however. In order to maintain a more dynamic site, John is exploring DIY design/maintenance. This is the latest film project in the works for director Nora Jacobsen. I worked with with The Frost Place for several years, until they took the work in-house. This is Robert Frost's home in Franconia NH, now a non-profit museum and a forum for poetry workshops and festivals. This is another land trust organization. Good people doing good work. This site is also managed in-house with Dreamweaver. is my oldest constant client -- I've done their site since '96. All along I've transformed the membership database (which is constantly changing) into a website with a script-widget I created, which still works quite cleverly. I update the site 2 to 4 times a year, generating over 350 member pages and also various ways links to those pages are organized and sorted -- the beauty of this database scripting. The user can find a linked list of all craftspeople in any region of VT, or any medium of craft -- glass, for example. 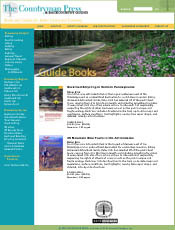 I recently redesigned this site in fall '04. Updated frequently. 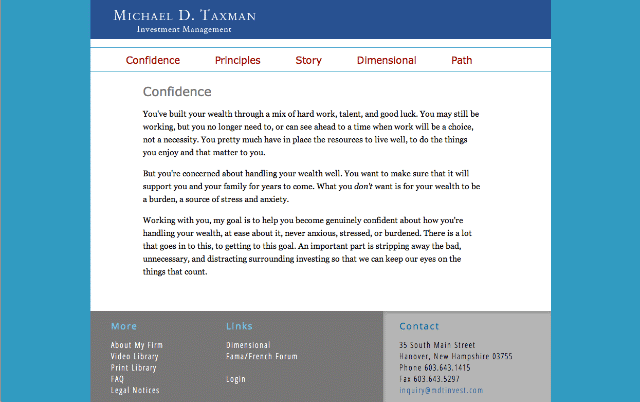 This started out as an ecommerce job for the development office at Dartmouth College back in 2004, but we ended up sending an encrypted form to collect the donations. I also sliced the design, did the CSS, and generally got the project up and running to meet a tight deadline. It's probably not live anymore. Countryman Press: I've done extensive photoshop work here and also made numerous html templates for the content management system. All of the little white categories on the left have their own template. 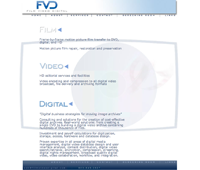 A medium sized site: 309 pages, 682 images (separate from the template graphics). 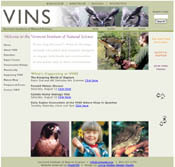 I served as webmaster for VINS for several years, managing the templates for their content management system; I also set up the e-commerce system for membership and raptor adoption, managed the web-commerce side of camp reservations, made some flash presentations, and helped with internet strategy. 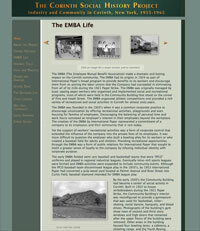 The site is currently managed in-house. Kimball Union Academy I took this beast of an in-house developed site and redesigned and tamed it. Still (always) in progress. Fall 06, updating of this site had been taken in-house. 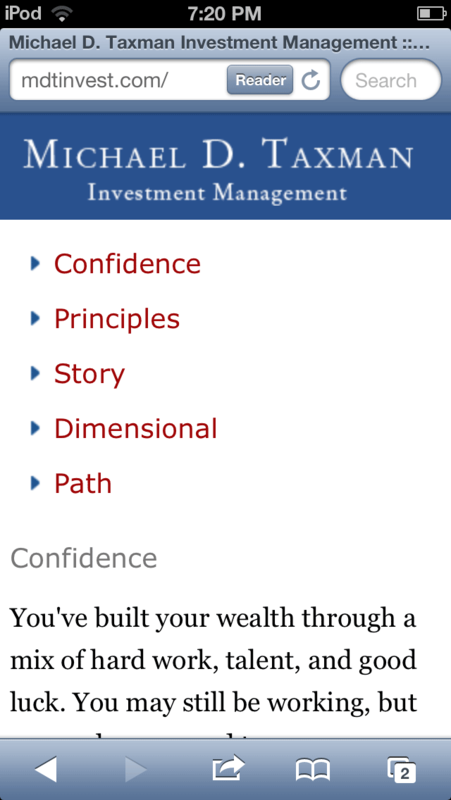 The site is currently in a content management system, and it has been redesigned by that firm. I really like this site. There is a lot of good information here. I'm particularly proud of having sorted out the recipe tangle, and provided access to over 500 recipes either by ingredients, recipe themes, or categories. This site served the coop for some years. 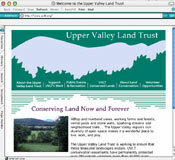 They have now taken it into a content management system developed for coops. I'll put up some sample designs of the site that was live soon. is a fantastic organization. I enjoyed working with them to conserve my own land several years ago, and it was a pleasure to work with them again to get their web site in shape. The design we did was meant to be simple and fast to load, on even the oldest computer. Times have changed. In another collaboration with Tim Sprague Design, I've worked on the polish-and-deployment end of a few of the American Skiing Company's Grand Summit Resort Hotel sites: Sunday River Grand Summit Hotel, Jordon Grand (at Sunday River) and Attitash's Grand Hotel. This is (was) the "mother ship" of many major ski areas, some of which I've worked for individually. Here I worked with another designer, Tim Sprague, and had some great content provided. The domain "peaks.com" now directs to www.thecanyons.com. 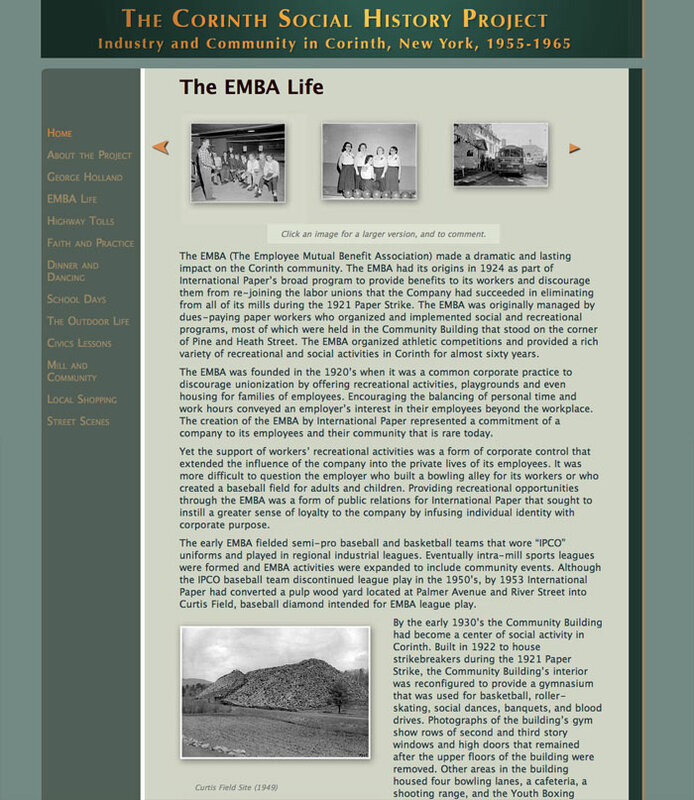 I also was responsible for this resort's site for a couple of years. 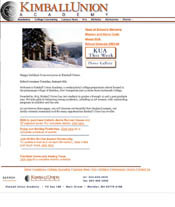 I was webmaster of killington.com from 5/97 through winter of '01. This has been a huge and very successful site by many measures under my tenure. We got high traffic, and we booked millions of dollars worth of ski-and-stay packages through the site, even in these early internet years. The site has been redone in a content management system for the winter of 02-03, and it's now in the hands of a new York firm. It's probably been changed several times since then.